With big ambitions to start a small-scale, bio-sustainable farm, we planted our first seeds in 2014 on land that Greta's family has been farming since the 1800's. Looking back, it's good we had that ambition, as we were lacking one minor detail: practical experience. 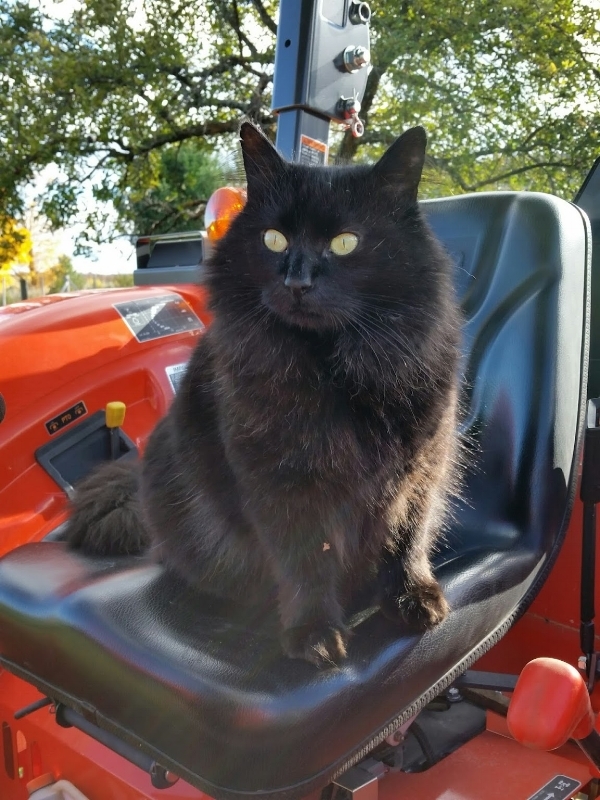 Neither of us had any background growing anything at the scale we planned to do and to say there's a steep learning curve to farming might be a bit of an understatement. Needless to say, we've had our share of challenges, but we've learned (and at times battled) our way through it. 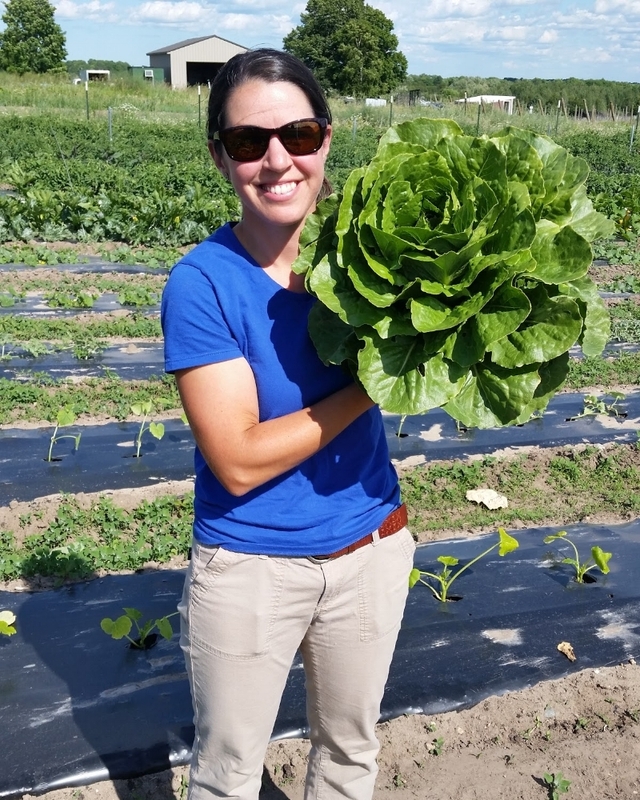 What started as one small table at the Cheboygan farmers' market in 2014, has turned into a few tables at the market and a 100+ member farm share program. 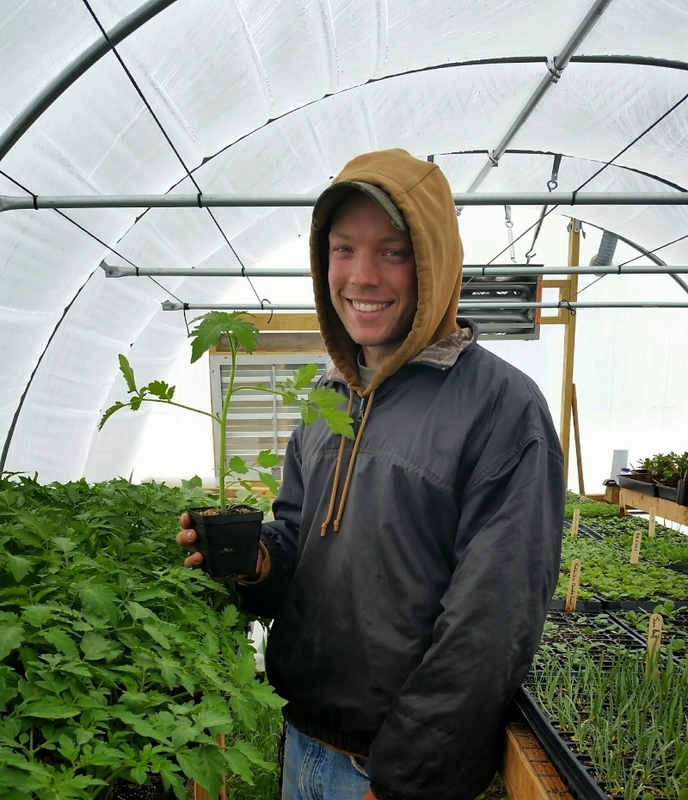 For us, farming is more than just growing produce, its about squashing the rumor that you can't make a living farming in a small town and the stigma of the struggling farmer. It's about dreaming big and overcoming obstacles, no matter how devastating they seem at the time. It's about keeping the Cheboygan farming culture alive and all of the great friendships we've made in the process. We're passionate about what we do and we hope it shows in the quality of everything we produce! Take a few minutes to check out everything Harvest Thyme has to offer and don't forget to sign up for our eNewsletter or head on over to our Facebook page before you're done! Just like it came out of Grandma's Garden! You'll never want to buy produce from the grocery store again! Fresh from our small local farm to you; over 40 varieties, from the popular to the unique, all hand-harvested and washed to give you only the freshest, longest-lasting produce you can buy! If you want to buy our lettuce heads just because they look like flower bouquets or our radishes because they're so clean they don't look real, well, you wouldn't be the first, and we surely won't judge you for it. Just don't forget to eat them, because they taste as good as they look! We eat all of the crops we grow, so we grow it the way we feel safe eating it! We believe the key to growing great crops is to maintain great soil that is full of life. To do so, we keep our spraying to a minimum, using only organic-approved pesticides at the lightest effective dose when absolutely necessary. We refrain from using destructive chemical fertilizers and pesticides and rely heavily on compost and cover crops to build fertility and prevent erosion throughout the growing season. Saturdays, 10am-1pm Cheboygan Indoor Market, 215 N Main Street, across from the Post Office. Join over 100 of your friends and neighbors in receiving delicious produce straight from Our farm! A custom-packed box full of your favorite veggies! A great way to eat well and enjoy everything the seasons have to offer! Fully-customizable shares. If you just don’t like beets, you’ll never see them in your share. Extended pick-ups, including new 24/7 pick-up location in Cheboygan. Weekly, bi-weekly or ‘choose-your-weeks’ share options. Recipes, cooking and storage tips automatically sent with each delivery. 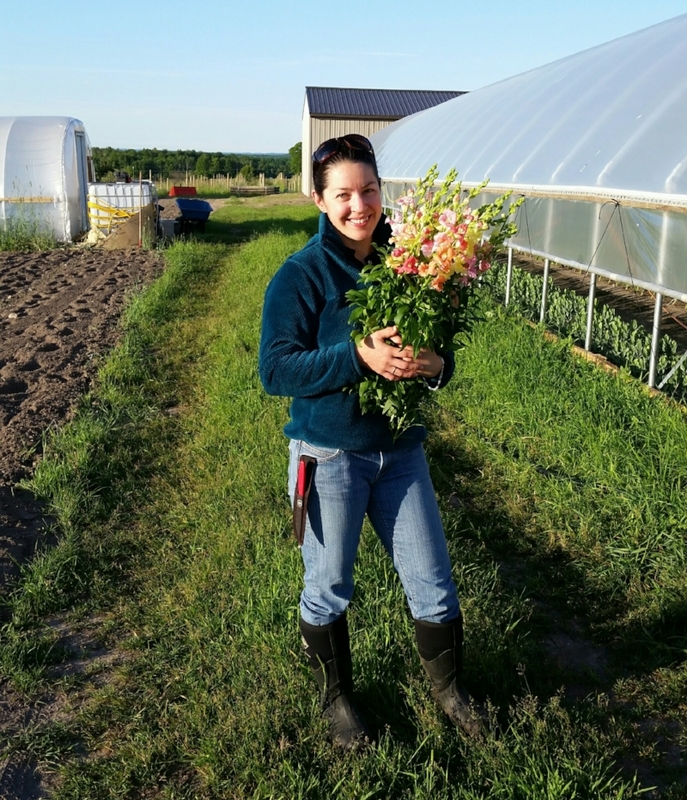 In just a couple short years, Greta has become known throughout Cheboygan for her hard-to-pronounce, gorgeous and long-lasting cut flowers. What began as a hobby with a few dahlia plants, quickly turned into dozens of varieties of flowers and thousands of individual blooms. Our use of hoophouses allows us to grow some more unique varieties that wouldn't otherwise grow in our area. 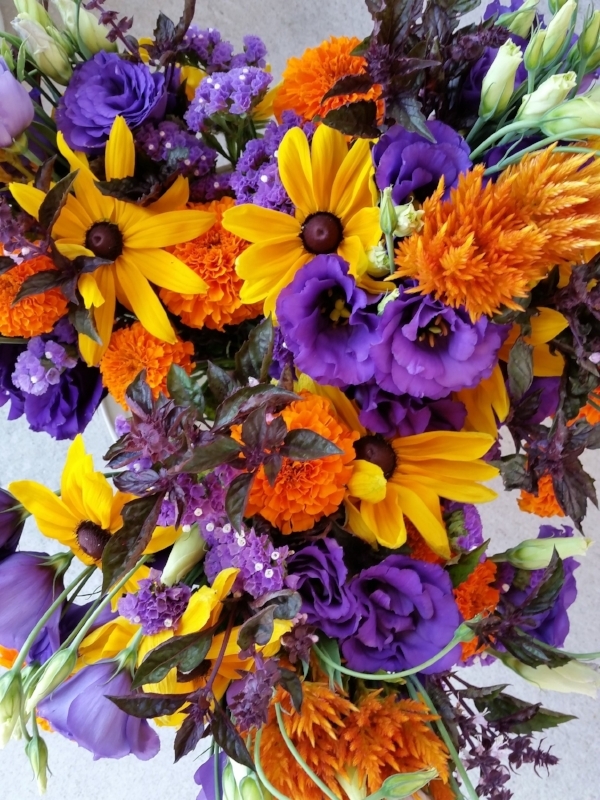 You can find our beautiful blooms at our farmers' market booth starting in late June through October. Want flowers with your veggies? Be sure to add them to your farm share! Grow a Great Garden this year! Your garden is only as good as the plants you put in it, so start with GREAT PLANTS! As a farm, we've spent years trialing hundreds of varieties of vegetables and herbs. We're taking that guesswork out of your garden, selling only our very BEST PERFORMING varieties for our tough climate! From broccoli to tomatoes and everything in between, we have nearly 50 VARIETIES for your gardening enjoyment! Check out our full line of certified organic seeds for crops best grown from seed! Just healthy plants for clean food! We will be offering 3, 4 and 6 pack vegetable and herb starts, as well as larger 3.5" potted tomatoes and herbs. All 4 packs, 6 packs and 3.5” annuals will be $3 per pack/pot or 2+ for $2.50 each. 3 pack veggies and 3.5” perennial herbs will be $4 per pack/pot or 2+ for $3.50 each. Join us on the farm for our 2019 Plant Sale! Need some growing tips straight from us? We’ll be happy to answer all of your growing questions during the plant sale to get your garden off to a great start!